The Occlusal & Soft Tissue Exam form has space to record your external, soft tissue, and facial support exam results. 100 forms per tablet. 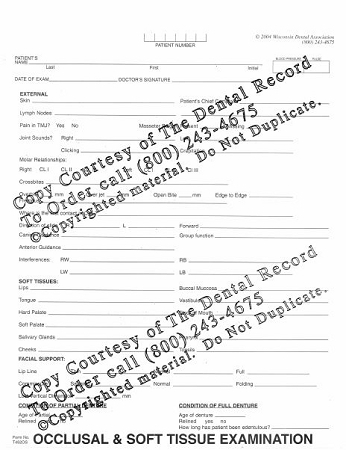 The Occlusal & Soft Tissue Examination form was designed to accompany the Periodontal Examination form and together complete the pre-treatment examination necessary before periodontal or other treatment. This form has space to record your external, soft tissue, and facial support exam results. It prompts you to check skin, lymph nodes, TMJ, joint sounds, molar relationships, crossbites, overbites, and more.